“What?” I hear you ask. Picture this. You, a steep hill and a giant plastic ball. No, it’s not quite like those little things the hamsters run around in, but it looks fairly similar. 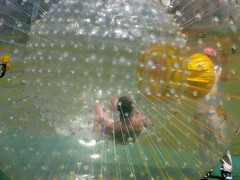 You sit inside a harness inside an inflatable clear ball and go hurtling down a hill. The adrenaline rush is fantastic and you’re guaranteed to have a smile on your face at the end of it all. There are lots of places through the UK where you can go zorbing. There are a number of companies which run these tree-top assault courses, but many of you will be familiar with the name ‘Go Ape.’ With fully qualified staff and safety features galore, this is the ideal way to get your thrills safely. With tree top high wires, tricky crossings and exhilarating zip wires, you’ll unleash your inner Tarzan with no trouble. Pony trekking is for the unadventurous. Llama trekking is where it’s at. They are such gentle creatures and are ideal for exploring areas such as Dartmoor. Being beasts of burden, they’ll even happily carry your sandwiches for you. This is no Mary Poppins set up, so forget the idea of a gentle afternoon in the park. This is kiting in the extreme. The giant kites can actually lift you off the ground and they are often combined with sand buggies and skates to give an even bigger adrenaline rush. 5. Fire and Broken glass walking. We’ve all seen those films where the hero is coerced into walking across hot embers to prove themselves. Well, you don’t need to travel halfway across the world to prove your mettle. After a brief introduction and seminar, you’ll be able (yes, really) to walk across hot coals reaching temperatures of over 1000 degrees Fahrenheit. If that’s not enough, you will also be offered the opportunity to walk across broken glass.